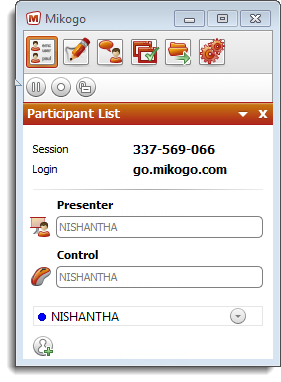 Create a new account in Mikogo website www.mikogo.com, its completely free of charge. After registering the account, your login details will received shortly through an Email. 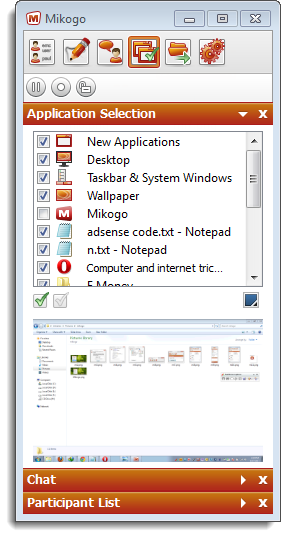 Install the Mikogo to the Computer and then it will automatically run the Application so that the small Mikogo window will appear in the Desktop. Click on the Start and press Start Session Button. Now it will starts the session and provide a Session Key (in my case 337-569-066) for you. This application also required to install on other Computer that you want to share the Desktop. Then, using the above generated Session key the other person can Join to the Session. There after, both Computers can be connected together. There, you can change the Presenter and Control to share the Desktop as you need. Also, you need to give permission to other person for accessing data and remote controlling. Here, the applications which are running on your PC can be control while sharing the Desktop. Simply you can check the differences by seleting them un-seleting them. In the Setting Section, it can be changed the Picture quality of the shared Desktop and some other features.